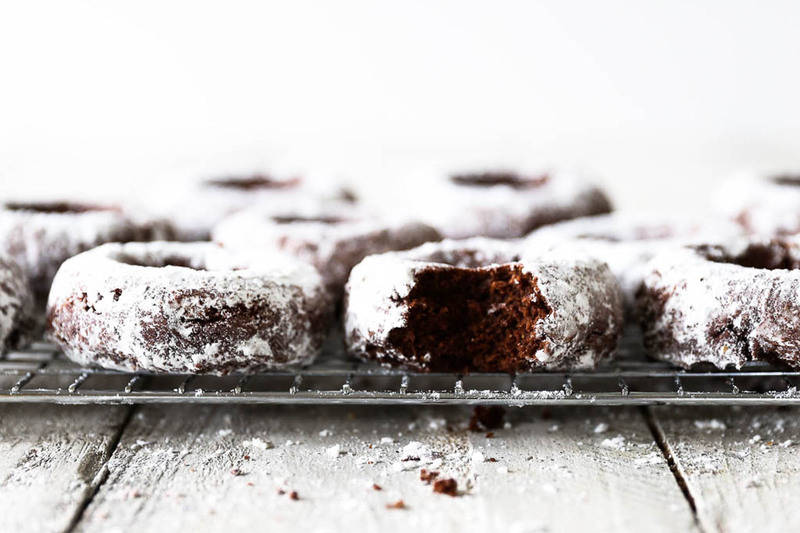 I recently did a 6 week cleanse which was essentially a sugar detox, i.e. no sugar, fruit or sweeteners of any kind for 6 weeks. Believe me, it wasn’t easy. When you start looking you find almost everything has sugar in it these days, and eating out (which we love) was challenging to say the least! I did feel amazing by the end of it though, and got some great results so it was well worth it. One of things I missed the most during the 6 weeks was nutrient-rich, raw desserts. 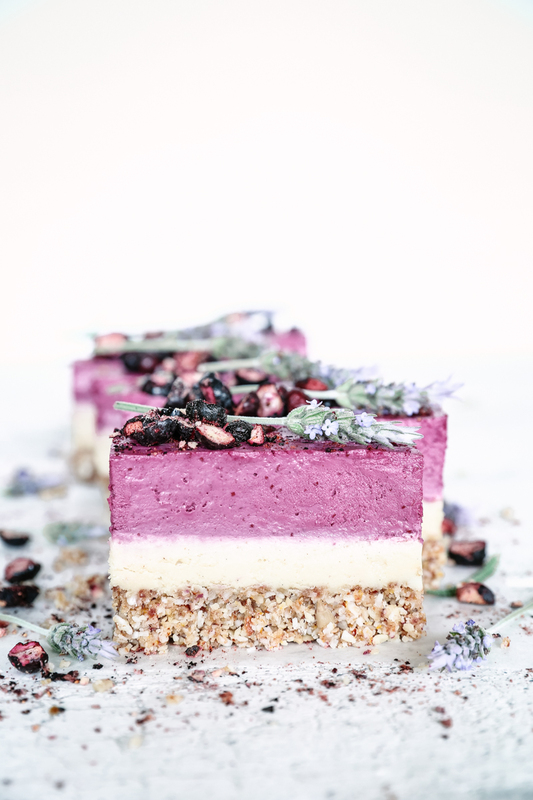 So to celebrate the end of my sugar detox I created this raw boysenberry and vanilla bean cheesecake. 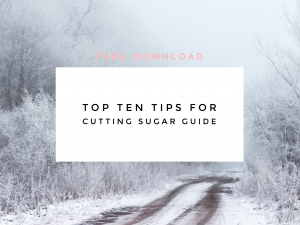 I chose a low fructose fruit to be the star and kept the unrefined sugar content as low as possible, as even though I finished my sugar detox I feel way better when I eat as little sugar as possible. For those not familiar with boysenberries, they’re very similar in appearance to blackberries but are slightly sweeter and have a purple and red hue. Most New Zealanders will associate boysenberries with the iconic ice cream flavour, but a quick google search told me their origins were in California and they’re the reason Knott’s berry farm became so famous (who knew!). They were introduced to New Zealand in the 1930’s and we are now the biggest exporter of them. 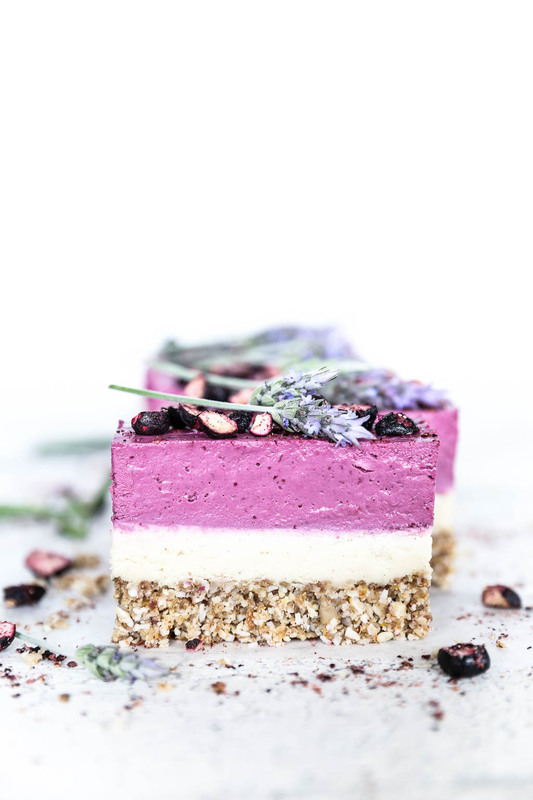 As proven by our iconic boysenberry ice cream flavour, vanilla and boysenberries are a match made in heaven so for this cheesecake I created a creamy vanilla layer and topped it with a tangy boysenberry layer. But I think if you wanted to swirl them together it would look and taste just as amazing. 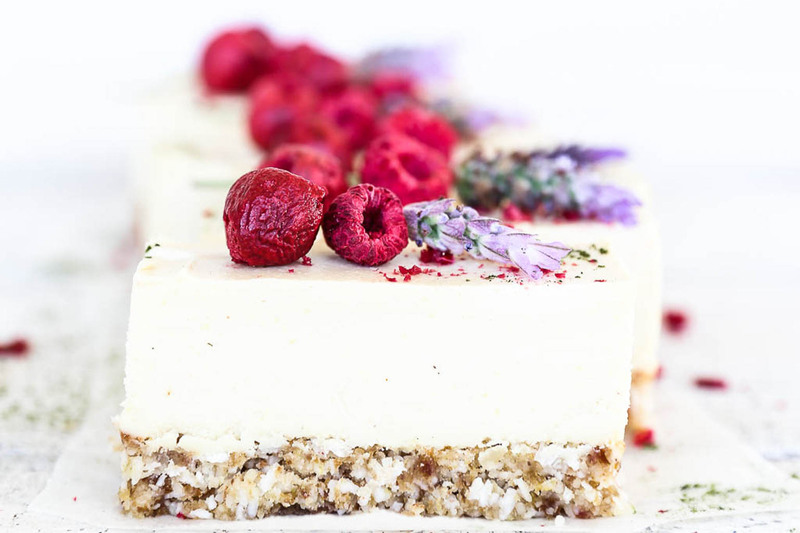 The base of this cheesecake is made from almonds, coconut, medjool dates, coconut oil and lemon zest. Medjool dates act as a binding agent and are a whole food sweetener that contain beneficial amounts of the minerals zinc, iron, potassium, magnesium, phosphorus and calcium, they also contain vitamins B6 and A and soluble dietary fibre. Dates are high in fructose which is not ideal if you’re trying to keep your sugar consumption low, however, their high fibre content slows down the fructose absorption and when combined with protein (in the form of nuts here) this also acts to slow it down. The cheesecake filling is made from a base of soaked cashew nuts, coconut milk, cacao butter, coconut oil and an unrefined sweetener. 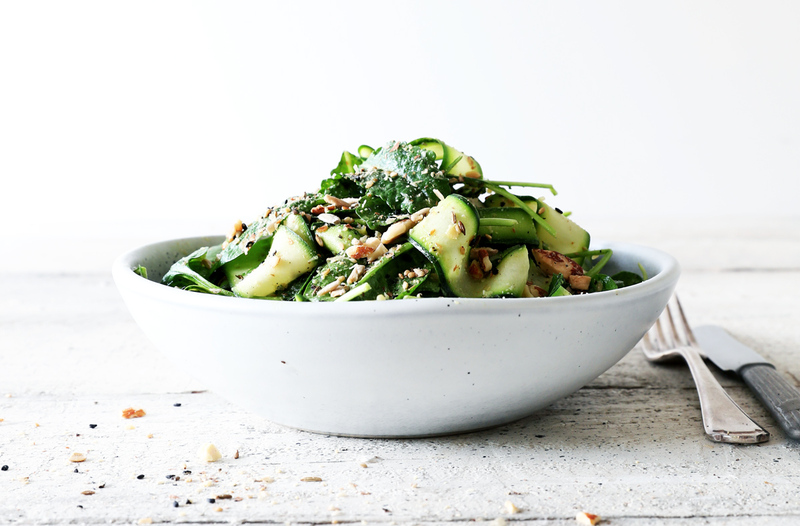 Soaking the cashew nuts makes them much easier to blend, creates a lovely creamy texture, and most importantly, removes the natural enzyme inhibitors and allows the cashews to be digested much more easily by your body. The addition of coconut milk helps create the right consistency and coconut oil provides a setting quality. Coconut oil is also great source of lauric acid which has anti-bacterial, anti-fungal, anti-viral and anti-inflammatory properties. It boosts your immune system and metabolism, lowers blood pressure and helps with the absorption of minerals. Even though coconut oil is a saturated fat, it’s considered a ‘heathier’ fat because lauric acid is a medium chain fatty acid and is processed by your body in the same way as carbohydrates as a direct source of energy. Raw cacao butter is the pure cold pressed oil of the cocoa bean and is very high in antioxidants. Antioxidants are so important because they reduce the inflammatory action of free radicals, which slows the ageing process. Woop! Boysenberries like most bramble fruits are also a fantastic source of antioxidants and as mentioned above, contain relatively low levels of fructose compared to other fruits. There are a couple of options to choose from for the sweetener in the cheesecake filling. Rice syrup is the lowest fructose choice and has the least sweet flavour. Pure maple syrup and raw honey will provide a sweeter flavour and while they contain more fructose than rice syrup, they also contain other beneficial nutrients. See the notes below for more on how to choose a good raw honey and pure maple syrup. 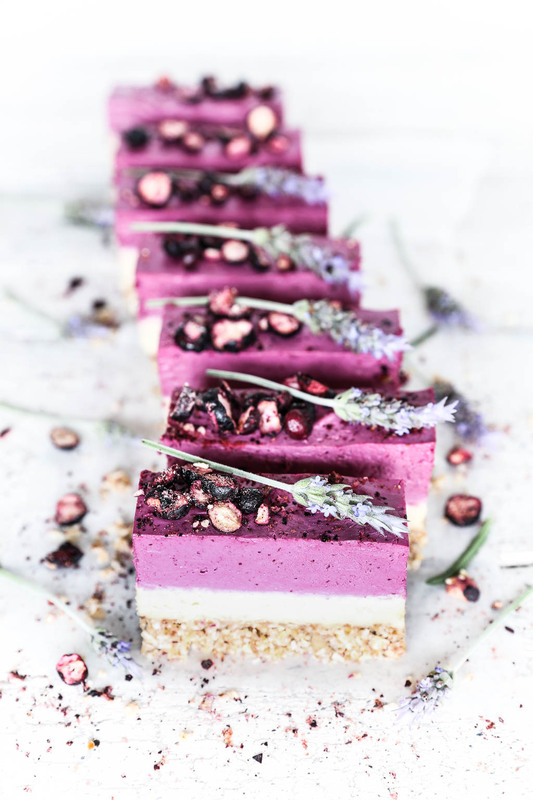 As you can see, this raw dessert is full of nutritional value which goes a long way in balancing out the unrefined and whole food sugars that it also contains. Plus, because it’s high in protein you’ll only need a small serving to satisfy. I hope you give this raw cheesecake a try and if you post any pictures to social media I would love to see them! Tag @swoon.food or #swoonfood so I can come and admire them. Enjoy! Start by soaking the cashew nuts, place them in a bowl, cover with filtered water and leave to stand for 2 to 4 hours. Drain off the water and rinse the cashews well. To make the base, gently melt the coconut oil by placing it in a heatproof bowl over a pan of steaming water with the heat turned off (see notes below). Place the sunflower seeds, desiccated coconut, almonds and salt into a food processor and blend until the mixture looks like chunky crumbs. Add the medjool dates (ensuring you have removed the pitts!) and blend until well combined. Add the lemon zest if using. Lastly add the melted coconut oil while the motor is running. Press the base mixture evenly into the prepared tin, then place in the fridge to set. To make the vanilla bean filling, gently melt the coconut oil and cacao butter by placing it in a heatproof bowl over a pan of steaming water with the heat turned off (see notes below). Place the soaked and drained cashews into a high speed blender (e.g. Vitamix/Blendtec) along with the coconut milk, pure maple syrup, lemon juice, sea salt and vanilla, and blend until smooth. Add the melted coconut oil and cacao butter gradually through the top of the blender while the motor is running. These should blend in completely and you should end up with a smooth vanilla cream. Pour the vanilla bean filling onto the prepared base, smooth with a spatula and place in the freezer to firm up. To make the boysenberry filling, gently melt the coconut oil and cacao butter by placing it in a heatproof bowl over a pan of steaming water with the heat turned off (see notes below). Place the soaked and drained cashews into a high speed blender (e.g. Vitamix/Blendtec) along with the boysenberries, coconut milk, pure maple syrup, lemon juice and sea salt and blend until smooth. Add the melted coconut oil and cacao butter gradually through the top of the blender while the motor is running. These should blend in completely and you should end up with a smooth berry cream. Remove the vanilla cheesecake layer from the freezer and if the top is just set when lightly touched it’s ready for the boysenberry layer to be carefully poured on top. If not return to the freezer to set up for another 10 minutes (unless you want a swirly cheesecake in which case the vanilla layer doesn’t need to be set). When the boysenberry layer has been added, smooth with a spatula and place back in the freezer to firm up. Transfer the cheesecake to the fridge a few hours before you want to serve it. To serve, lift the cheesecake out of the tin using the cling film, place on a chopping board and peel back the cling film. Cut into slices, place on serving plates and decorate with freeze dried berries and edible flowers. Once defrosted the raw cheesecake will keep in a sealed container in the fridge for up to 5 days. Note on activating nuts: activating is the process of soaking nuts (or seeds) in water to remove the natural inhibitor enzymes on their skins to make them more digestible. The cashews in this cheesecake filling are therefore activated. If you also wanted to activate the nuts in the base for this recipe they would need to be soaked and then dried. Ideally this would be in a dehydrator at 46ºC for 1 1/2 – 2 days, or in an oven on the lowest fan bake setting with the door ajar for a couple of hours. The aim is to keep the nuts below 46ºC so the nutrients remain unaffected by heat and the food still deemed raw. High fat nuts like brazil and macadamia nuts don’t show significant nutritional benefits from this process, so there isn’t any advantage in activating these. Note on melting raw ingredients: to ensure ingredients remain in their raw form and their nutrients fully intact, they must not be heated above 46ºC. When melting raw coconut oil or raw cacao butter, place the bowl of ingredients over a pot of steaming water with the heat turned off. This should ensure the ingredients do not heat above 46ºC.